The Town of Weston is an attractive suburban town on the perimeter of metropolitan Boston. Incorporated in 1713, the town is located on a rugged upland plateau. Early settlers discovered that the amount of useful agricultural land was limited as was the water power potential in the town. 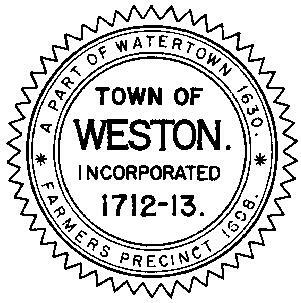 But colonists moving in from Watertown in the mid-17th century established scattered farms in Weston and by 1679 a sawmill, several taverns, some doctors and, according to the historians, "probably some lawyers", had settled in Weston. By the 18th century residents were profiting by the traffic on the Boston Post Road. Taverns of great historic importance were established on the Road. The Golden Ball Tavern, built in 1750, still exists in the town. Unfortunately, commercial stagnation followed the loss of business after the opening of the Worcester Turnpike in 1810 drew commercial traffic from the Boston Post Road. Townspeople turned to boot and shoe making, and the manufacturing of cotton and woolen mill machinery. By 1870, substantial country estates were being built in Weston by Bostonians, establishing a prosperous residential character for the town. Farming continued to be a significant support for the local economy and an organ factory opened in 1888 which employed some residents. The Weston Aqueduct and Reservoir was built in 1903 and the Hultman Aqueduct followed it in 1938 to bring Quabbin Reservoir water into Boston. In exchange, Boston residents continued to build homes in Weston, many of them architect designed. Such famous architects as McKim and Richardson designed luxurious houses in the town, which witnessed a rapid increase in population from 1920 to 1935 and then again after World War II. The Boston oriented suburbanization has continued as a major factor of the town's development. Residents are very proud of the town's school system and the handsome homes in quiet, well-kept neighborhoods, but tend to brush off the town's reputation as one of the most affluent communities in the state.